From the best-selling author of THE DINOSAUR HUNTERS and THE LOST KING OF FRANCE comes the story of how our modern world was forged - in rivets, grease and steam; in blood, sweat and human imagination. From the best-selling author of THE DINOSAUR HUNTERS and THE LOST KING OF FRANCE comes the story of how our modern world was forged - in rivets, grease and steam; in blood, sweat and human imagination. The nineteenth century saw the creation of some of the world's most incredible feats of engineering. Deborah Cadbury explores the history behind the epic monuments that spanned the industrial revolution from Brunel's extraordinary Great Eastern, the Titanic of its day that joined the two ends of the empire, to the Panama Canal, that linked the Atlantic and Pacific oceans half a century later. 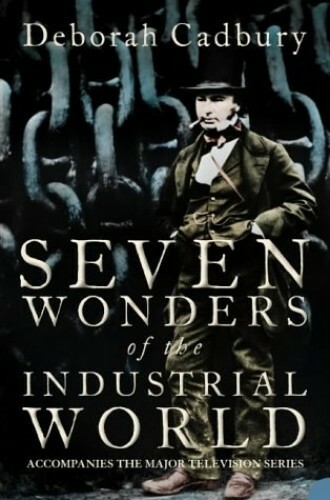 Seven Wonders of the Industrial World recreates the stories of the most brilliant pioneers of the industrial age, their burning ambitions and extravagant dreams, their passions and rivalries as great minds clashed. These were men such as Arthur Powell-Davis, the engineer behind the Hoover Dam, who dreamed of creating the largest dam in the world by diverting the entire Colorado river, one of the worlds most dangerous and unpredictable, or John Roebling, who lost his life creating the Brooklyn Bridge, the longest suspension bridge ever built. These are also the stories of countless unsung heroes - the craftsmen and workers without whose perseverance nothing would have been achieved, not to mention the financiers and shareholders hanging on for the ride as fortunes - and reputations - were lost and won. Cadbury leads us on an amazing journey from the freezing snows of the Alps to the mosquito-ridden wilds of the Central American jungle as we see uncontrollable rivers tamed, continents conquered and vast oceans joined.